Chocolate Buttons for Grown-ups! 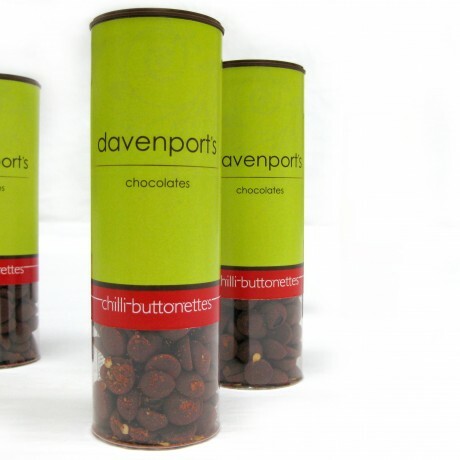 These chilli infused dark chocolate buttons are a great vegan chocolate treat. 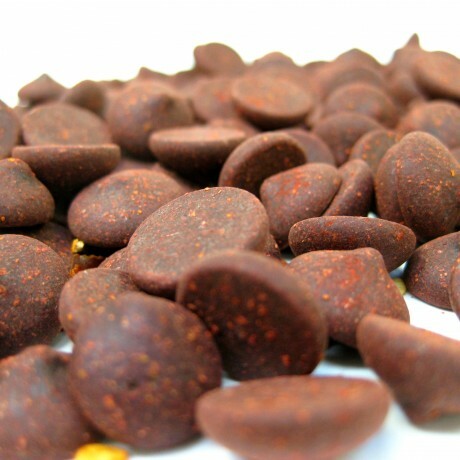 Our 53% dark chocolate buttonettes are hand-tossed in intense Bazaharat spices, cinammon, cumin, nutmeg and chilli flakes and have a warm, well rounded flavour. Great for nibbling at your desk, keeping in your handbag, or can be used in hot chocolate, muffins, cakes and much more. Dark Couverture Chocolate (Cocoa Mass, Sugar, Cocoa Butter, Emulsifier: Soya Lecithin, Natural Vanilla Flavouring) Baharat Spice (Cracked Black Pepper, Crushed Roasted Cumin Seed, Smoked Paprika, Sea Salt, Crushed Roasted Coriander Seed, Cinnamon Powder, Nutmeg Powder, Cumin Powder, Dried Mint, Cardamon Powder, Dried Rose Petals, Clove Powder), Colour Powder With Mica And Iron Oxides (E555, E172), Chilli Powder. Contains: Soya. May also contain: nuts and milk. Per 100g: Energy 2292.2kJ/ 547.4kcal, Fat 36.4g (of which saturates 21.8g), Carbohydrates 45.3g (of which sugars 42.6g), Fibre 8.1g, Protein 5.1g, Salt 0.04g.